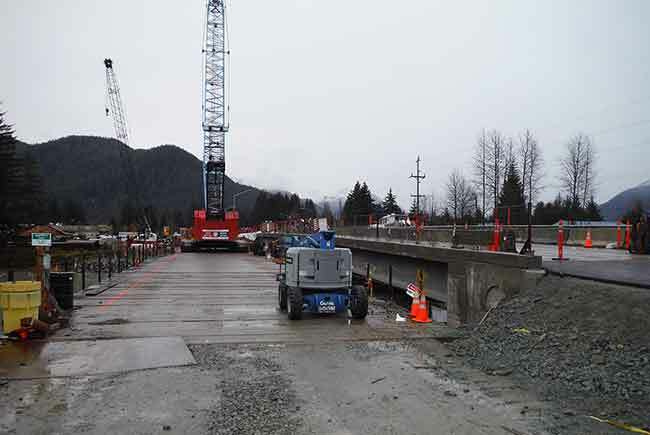 In spring 2014 the Department of Transportation and Public Facilities began the construction on the Brotherhood Bridge Replacement Project. 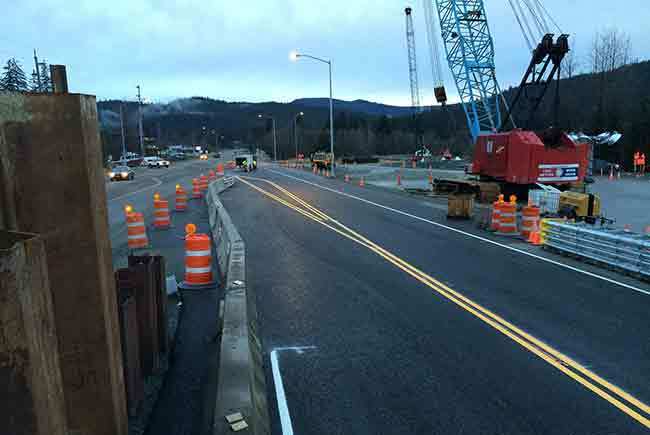 Upon completion the new Brotherhood Bridge will accommodate two lanes of traffic in each direction, a multi-use path on the upstream side, a sidewalk on the downstream side, and a left turn lane for vehicles turning onto Industrial Blvd. In addition, a multi-use path will begin at Riverside Drive and continue to Engineer's Cutoff Road. An existing equestrian trail, displaced by the multi-use path construction, will also be rebuilt to accommodate horse traffic between Wildmeadow lane and Engineer's Cutoff Road. The existing bus stops will be adjusted to fit the new design. 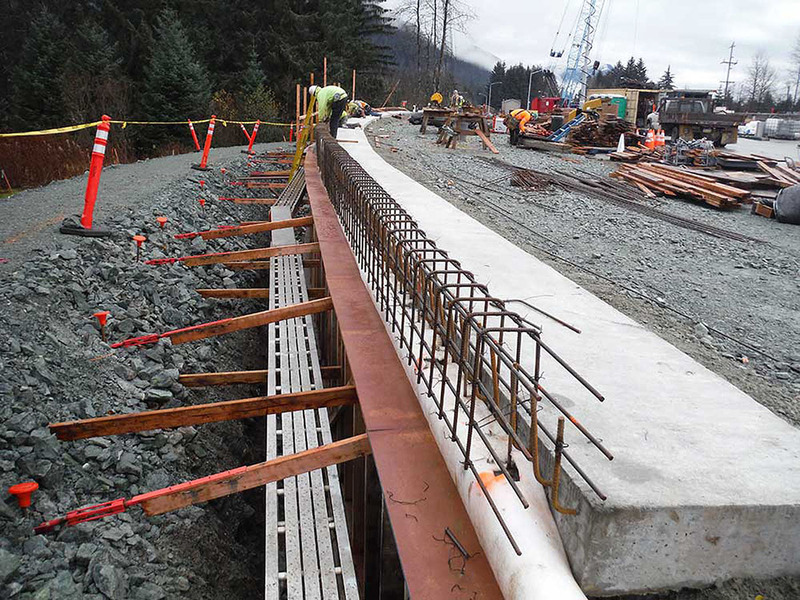 Underneath both sides of the bridge, non-motorized paths will be constructed to allow for pedestrians and bicyclists to safely cross the highway. The new Brotherhood Bridge will be constructed in two phases. 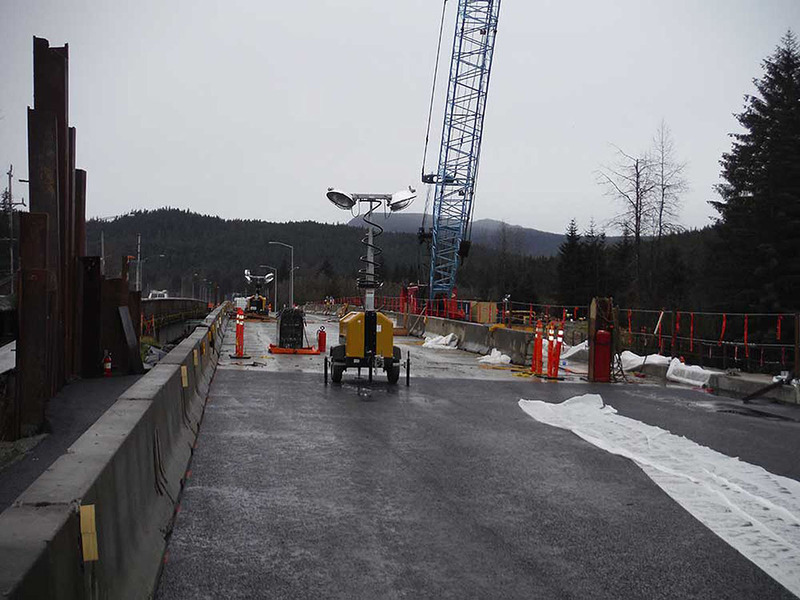 Phase 1 is the upstream portion of the bridge and will consist of a six foot sidewalk on the upstream edge and two lanes for traffic. 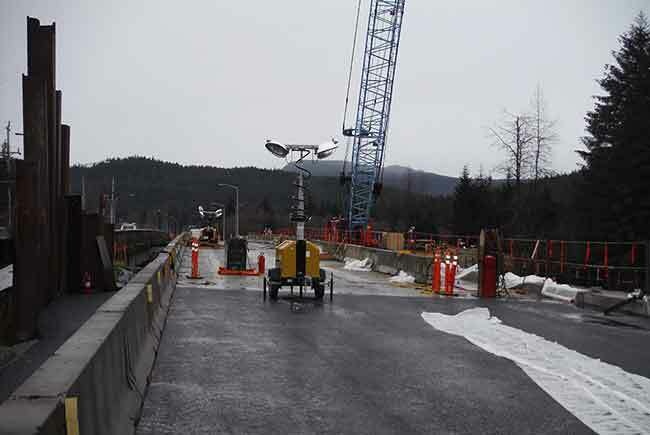 Once Phase I is completed traffic will be moved from the existing bridge to Phase I. Phase 2 consists of the downstream portion of the bridge and will connect with the Phase I portion. 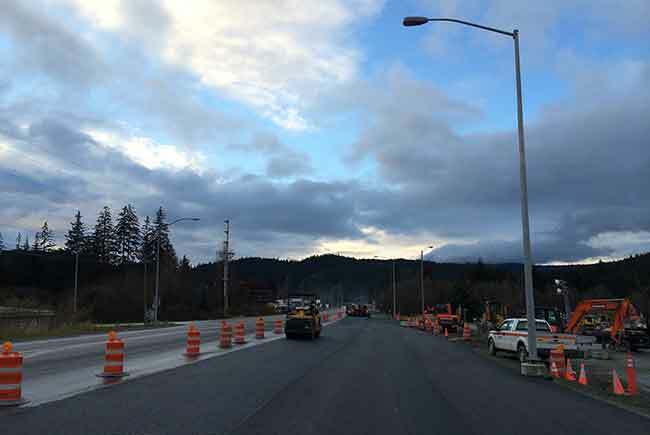 Phase 2 will add an additional 2 lanes for traffic and a center turn lane onto Industrial Blvd.. CONTRACTOR: Orion Marine Contractors, Inc. 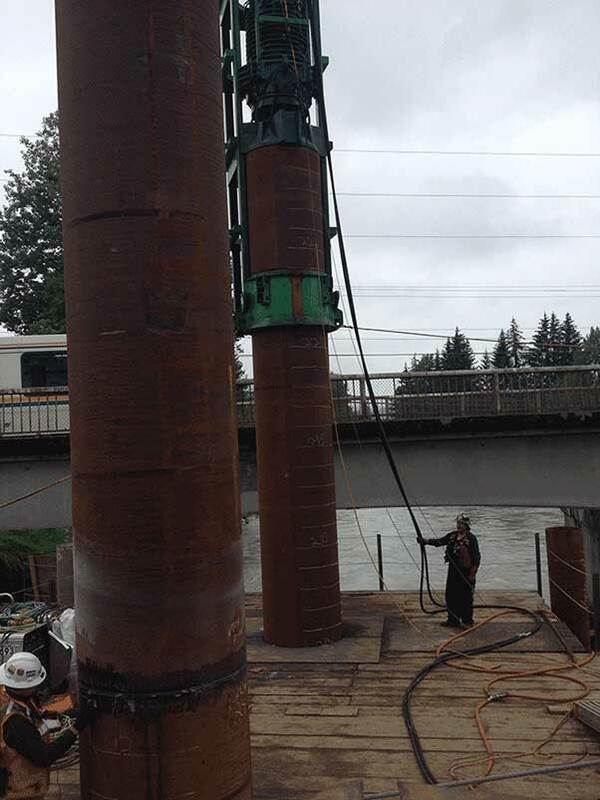 PHASE 1 PIER PILES: Installation began on 6/24/2014 and was completed on 7/19/2014. 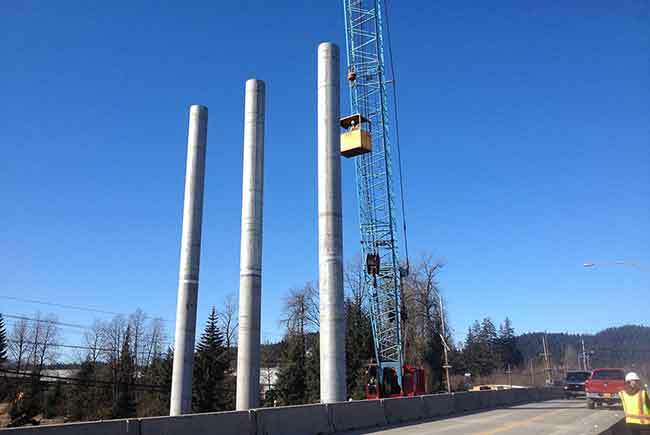 Four 48” diameter piles were installed for Phase One, two for each pier. The piles for the east pier (Downtown side) were driven to bedrock, 275 feet deep. 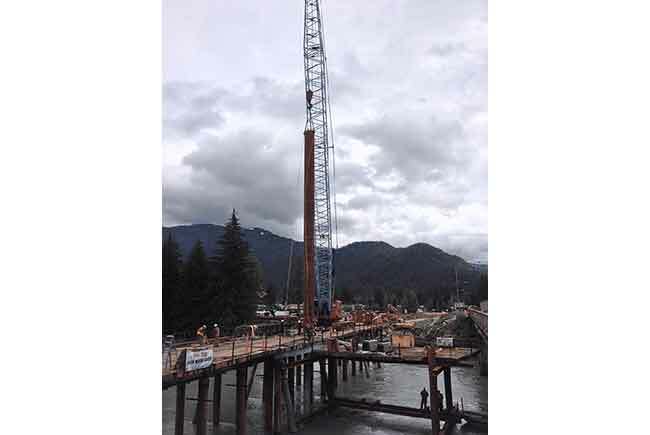 The west pier piles (Auke Bay side) were driven to approximately 240 feet below ground surface. 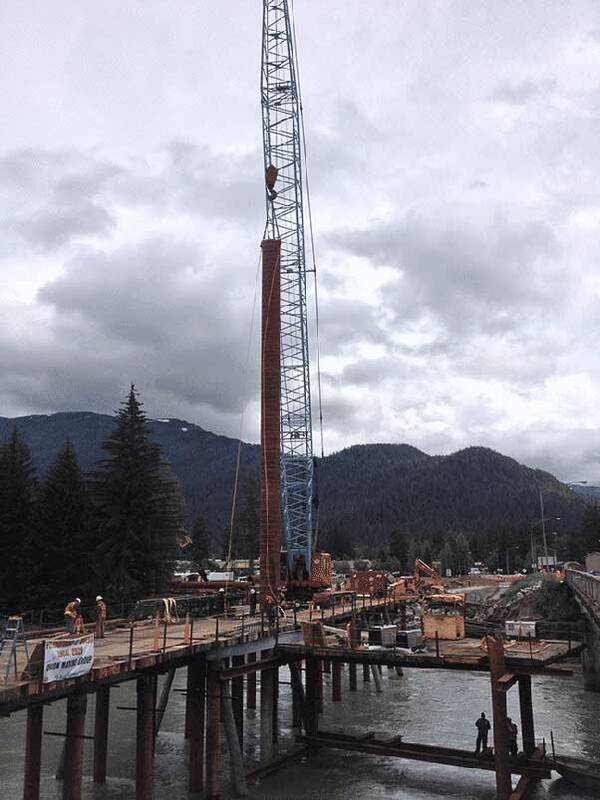 PHASE 1 ABUTMENT PILES: Installation began on 7/17/2014 and was completed on 8/15/2014. 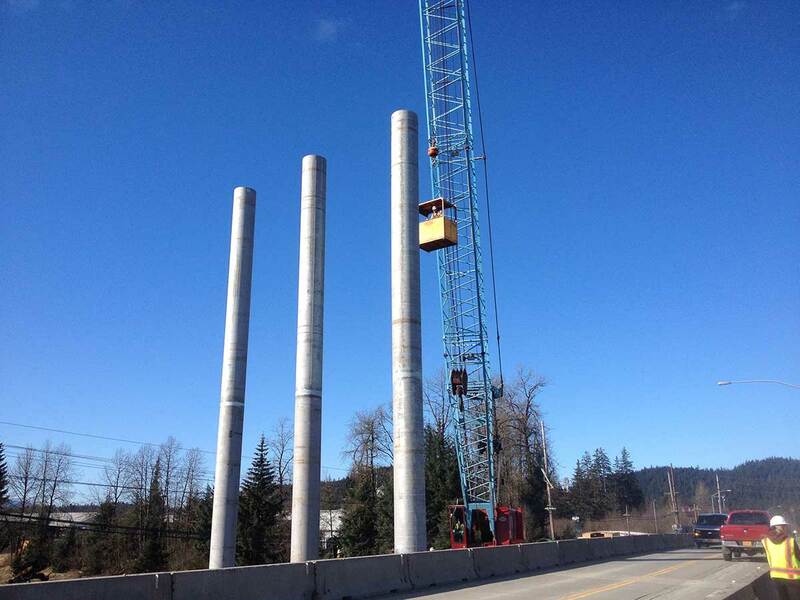 Twelve 24” diameter piles were installed for Phase One, six at each abutment. The piles were driven approximately 140 feet below the ground surface. POUR PHASE 1 PIER CAPS: Installation of the concrete pier caps began on 8/21/2014 and ended on 9/10/2014. The pier caps support the girders for the bridge. 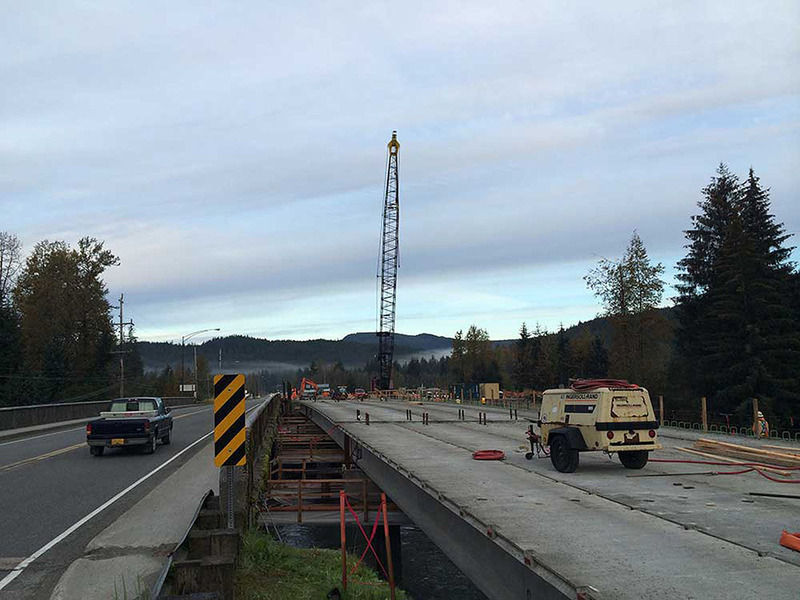 SETTING PHASE 1 GIRDERS: SEPTEMBER 2014 – The girders are precast concrete members that span across the river. They were fabricated in Washington state. 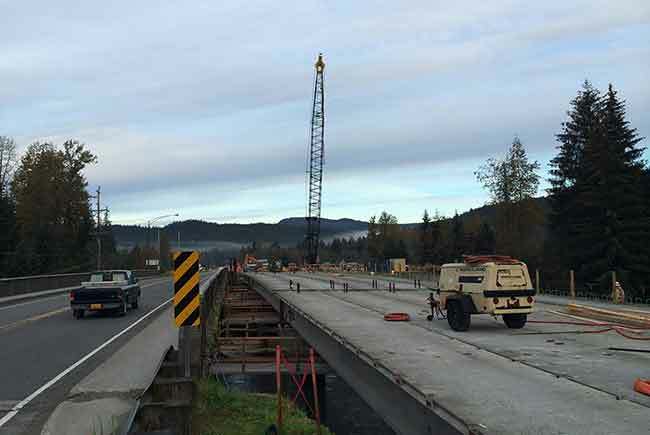 Fifteen girders were installed for Phase One between 9/18 and 9/23. 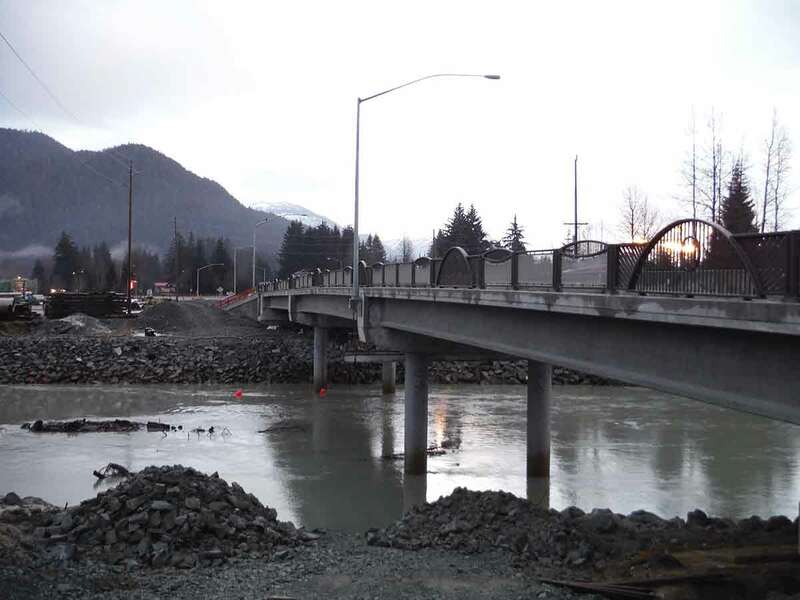 Traffic was stopped in downtown Juneau at Shattuck Way, S. Seward Street, and Main Street so the girders could be hauled through the downtown roundabout. Traffic closures lasted approximately 15 minutes. 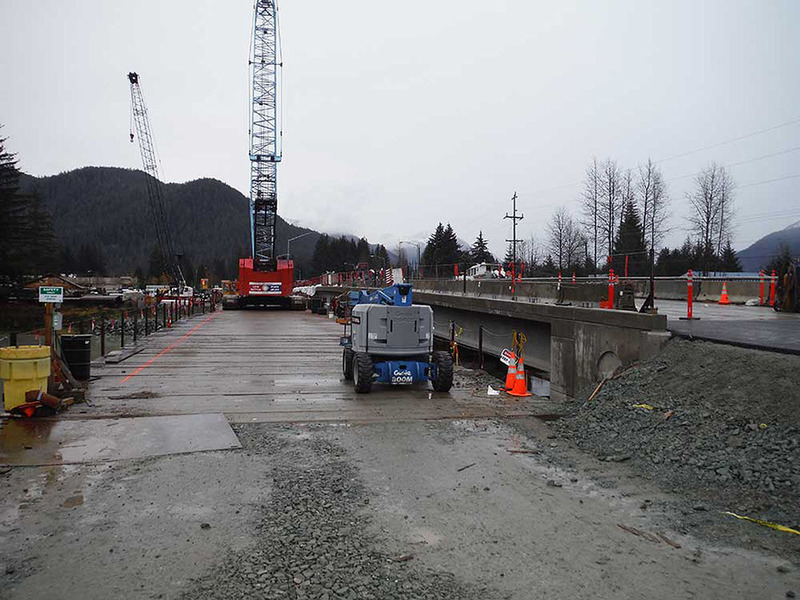 After girders were placed the pier diaphragms and abutment diaphragms were poured and girders grouted together. 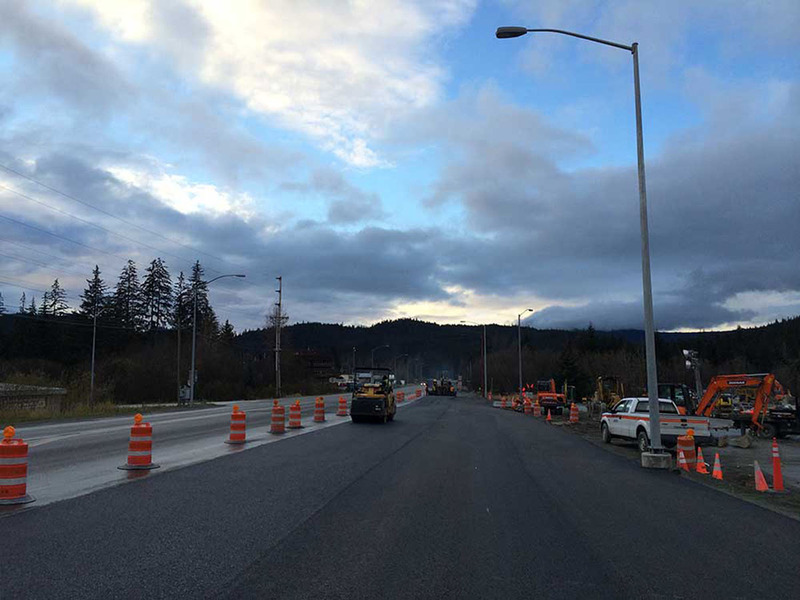 MOVE TRAFFIC TO PHASE 1 BRIDGE: NOVEMBER 2014 – The approaches to the Phase I bridge were paved on 10/26. The new lane markings will be painted between 11/1 and 11/15. 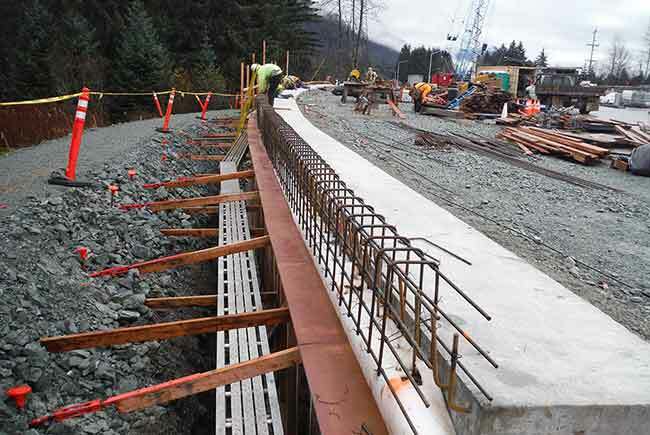 Concrete barriers were installed. 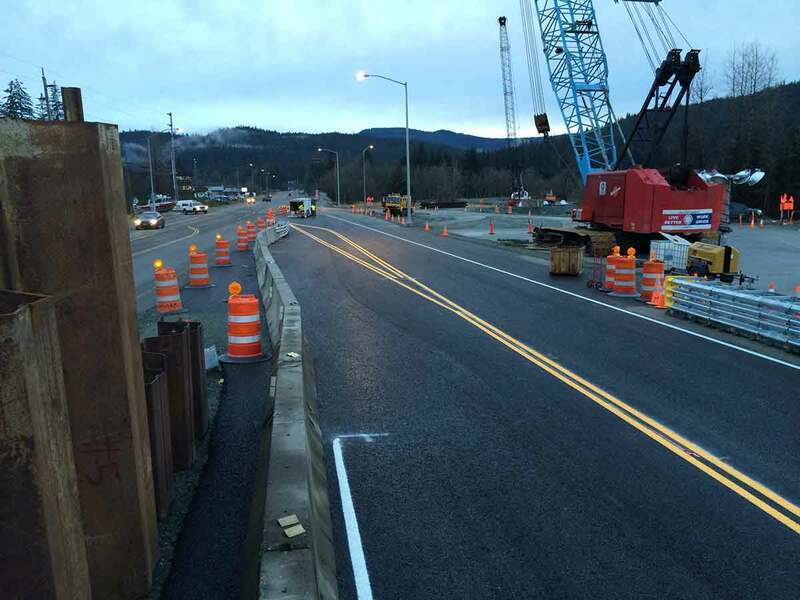 Traffic will be moved from the existing Brotherhood Bridge to the completed Phase 1 section on 11/15. There may be periodic traffic delays during the transition, but the bridge will not be closed. Traffic will not be detoured around Backloop Road. 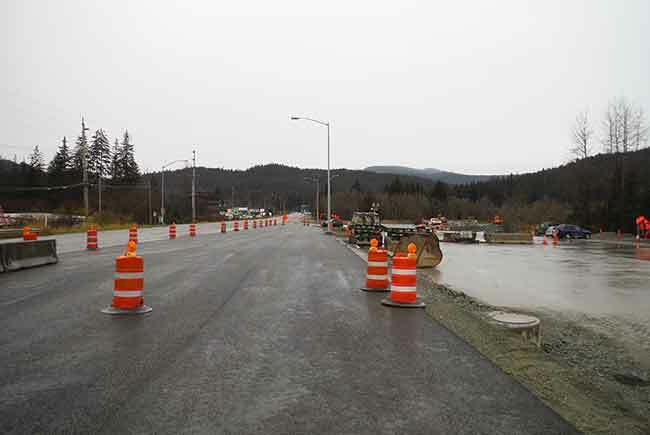 This new traffic pattern will be in place until Phase 2 of the bridge is completed (Fall 2015). The existing CBJ waterline is being relocated to the Phase One of the bridge. 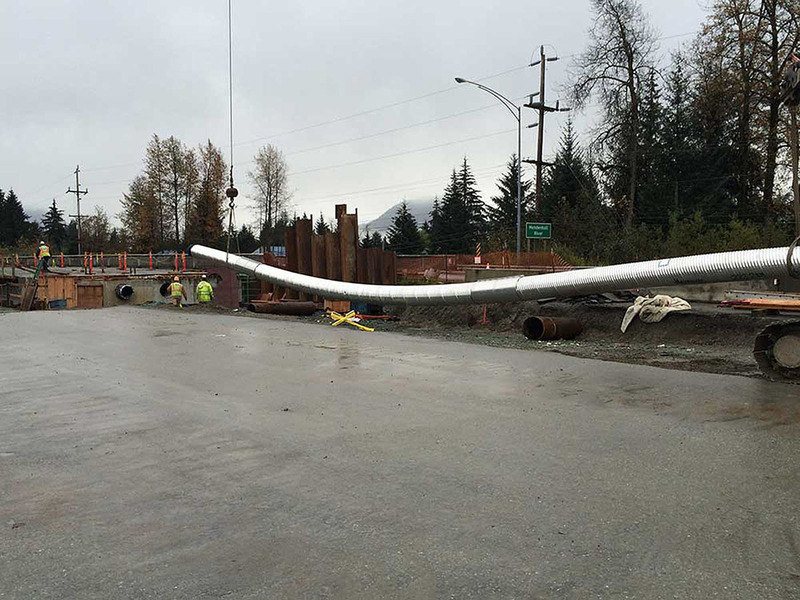 The new waterline was placed under the bridge and will be hooked up at the end of November/beginning of December. BEGIN DEMOLITION OF OLD BRIDGE: Fall 2014 – Demolition of the existing bridge will take approximately two months. 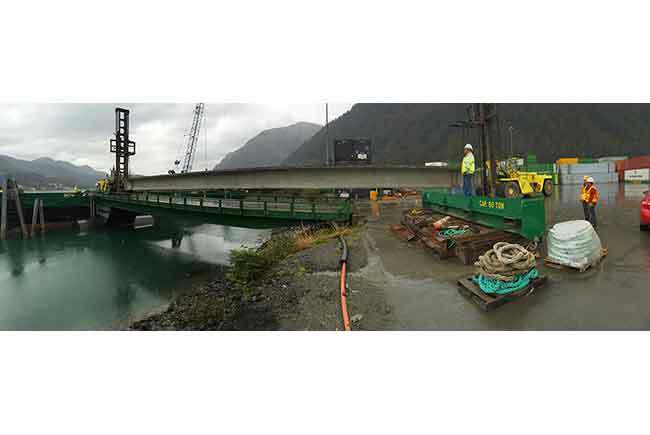 Steel from the existing bridge will be shipped from Juneau to a steel mill for recycling. 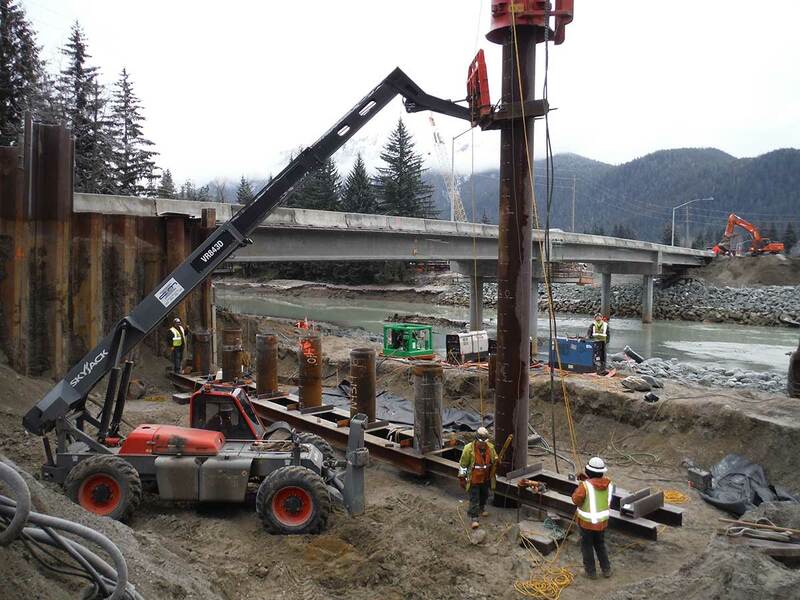 DRIVE 48” PIER PILES FOR PHASE 2: JANUARY 2015 - Six 48” diameter piles will be driven to complete the bridge piers. 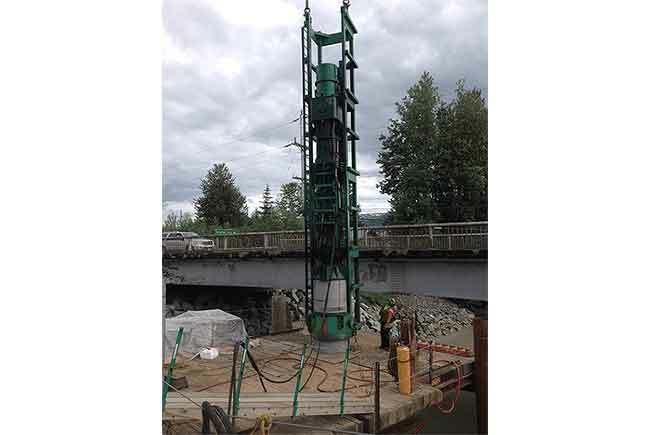 The piles will be driven to bedrock, approximately 275 feet deep. 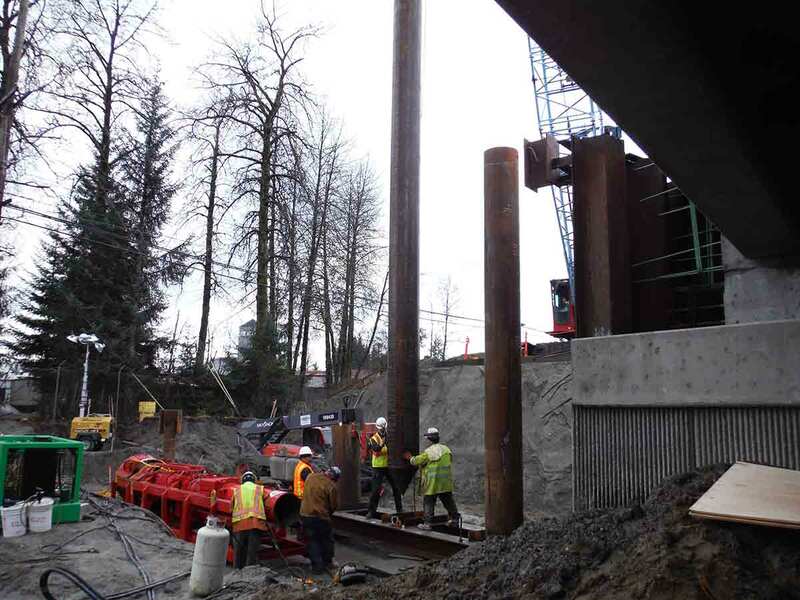 DRIVE 24” ABUTMENT PILES FOR PHASE 2: SPRING 2015 – Sixteen 24” diameter piles will be driven to complete the bridge abutments. 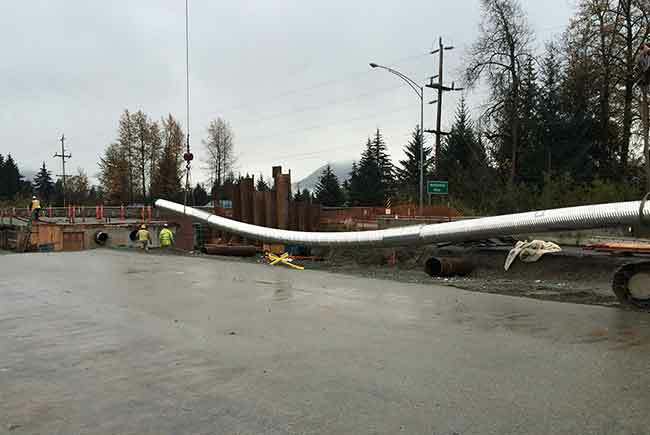 The piles will be driven to a depth of approximately 140 feet. SET GIRDERS FOR PHASE 2: SPRING/SUMMER 2015 – Twenty seven girders will be set for Phase 2. 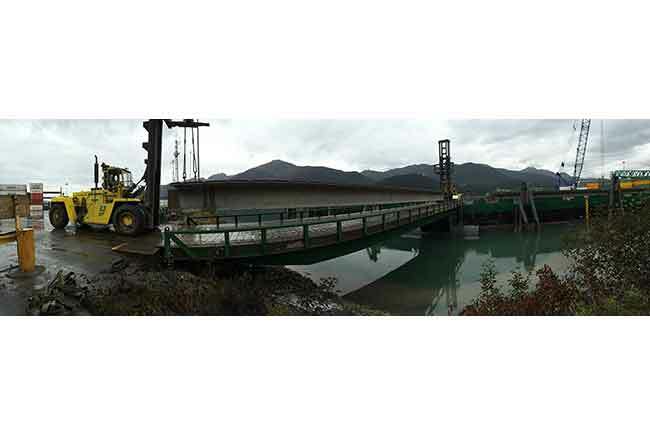 Girders will be hauled from Alaska Marine Lines and set on the bridge at night. 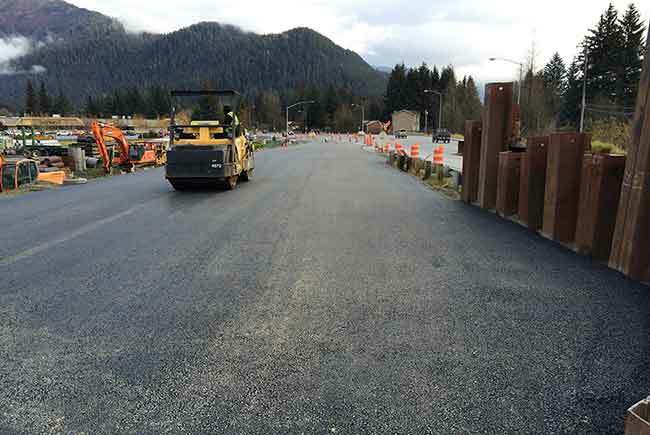 FINAL PAVING: LATE SUMMER 2015 – Asphalt concrete paving is estimated to begin mid-August 2015 and end in September. 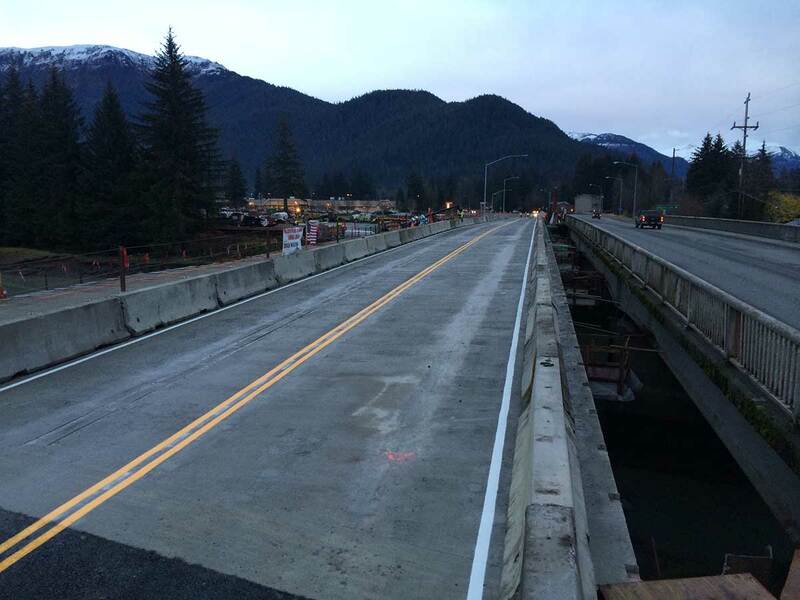 OPEN NEW BRIDGE FOR TRAFFIC: SEPTEMBER 2015 – The completed bridge will be open to traffic. 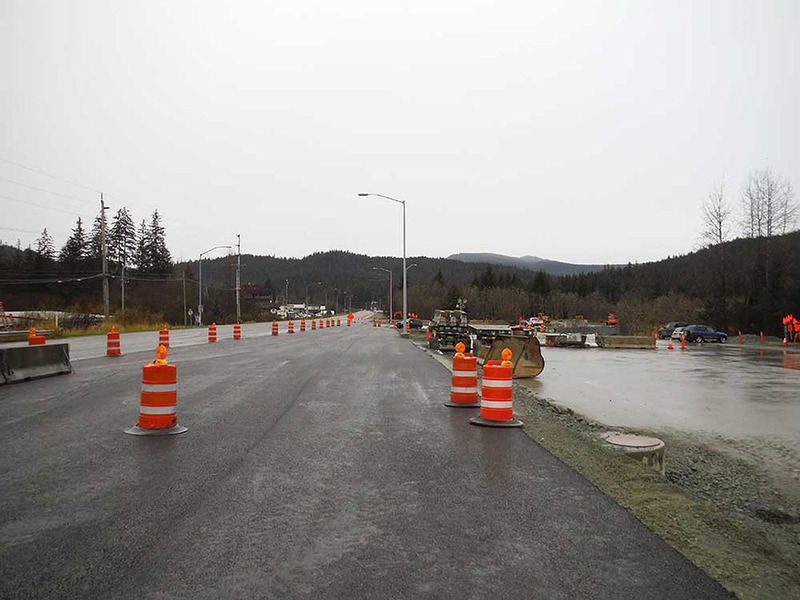 There will be two lanes for northbound and south bound traffic, a center turn lane, and sidewalk on the upstream and downstream sides of the bridge. Phase II of construction on the Brotherhood Bridge is in full swing. 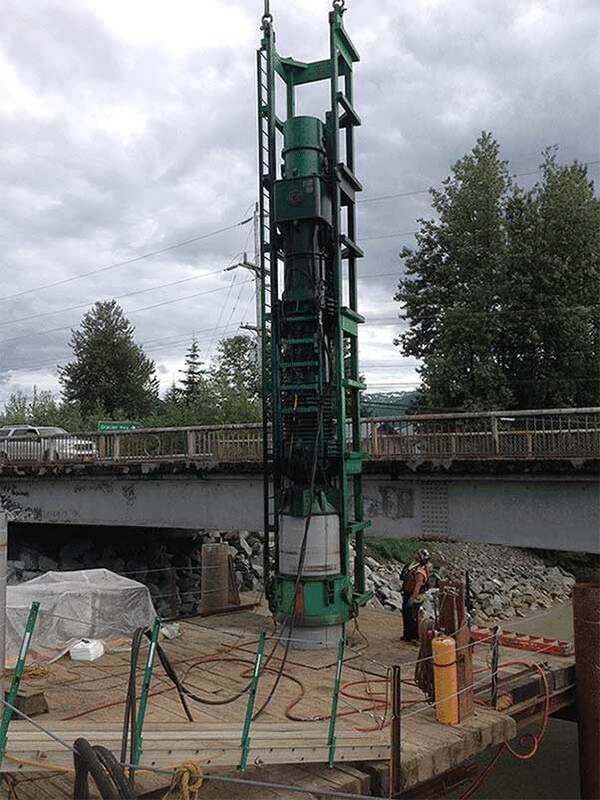 Pile driving at the abutments and Pier 2 has been completed. Pier 3 pile driving began April 6. 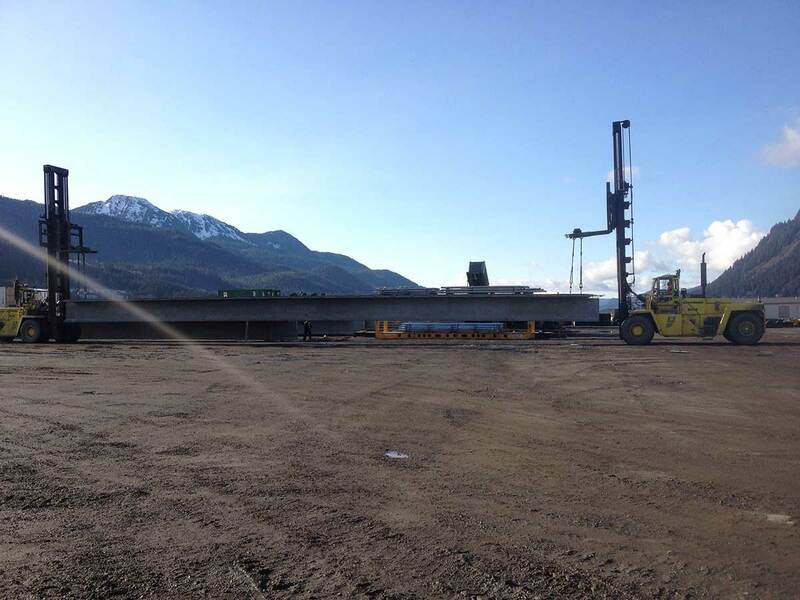 The next span of girders is scheduled to be set at the end of April, and the bridge is expected to complete by July. 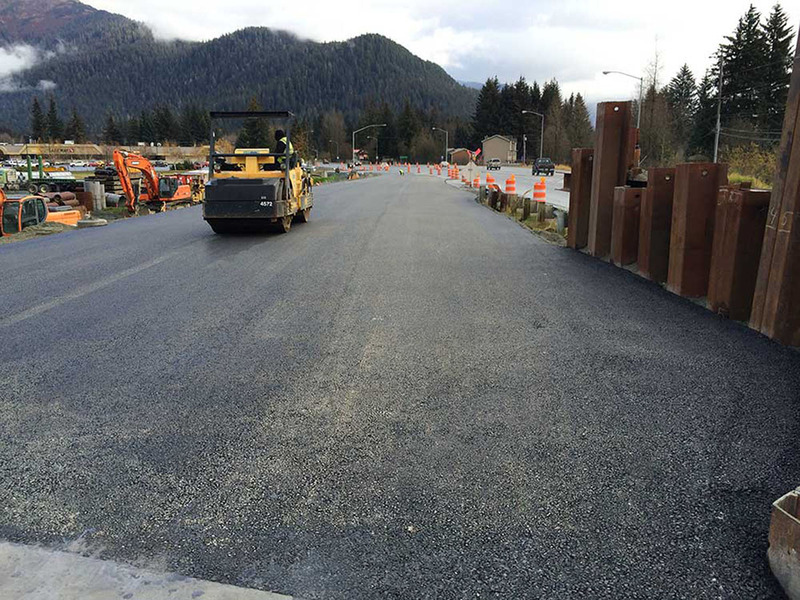 Final paving should begin in August, and the project will be fully wrapped up by the end of September. From Northwest corner bank looking East. 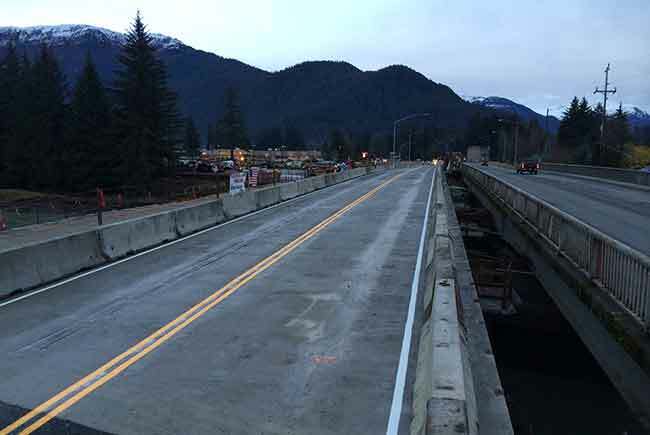 New Phase 1 bridge complete. 24” Steel Pipe Pile being placed, to be driven, for Abutment 4 Phase 2. 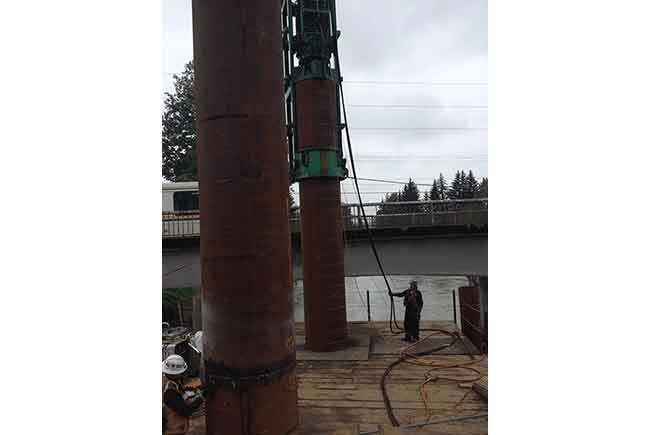 Driving 24” Steel Pipe Pile for Abutment 4 Phase 2. From Southwest corner bank looking East. 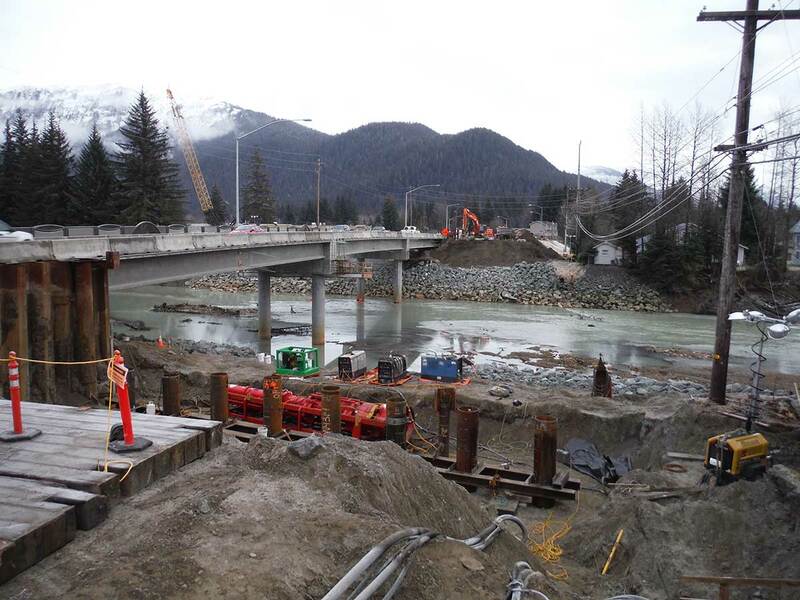 Phase 1 bridge complete, and Abutment 4 piles for Phase 2. First pier piling being set. 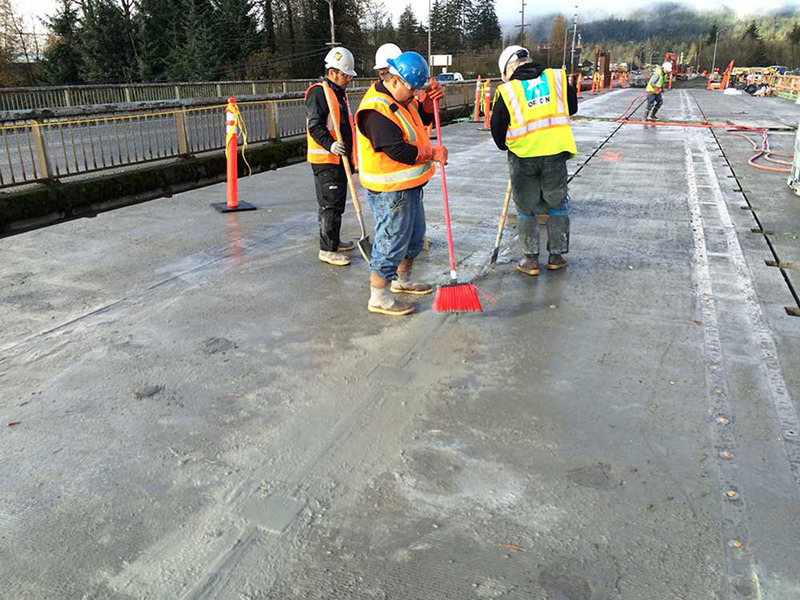 Paving the approaches to the Phase 1 portion of the Brotherhood Bridge. 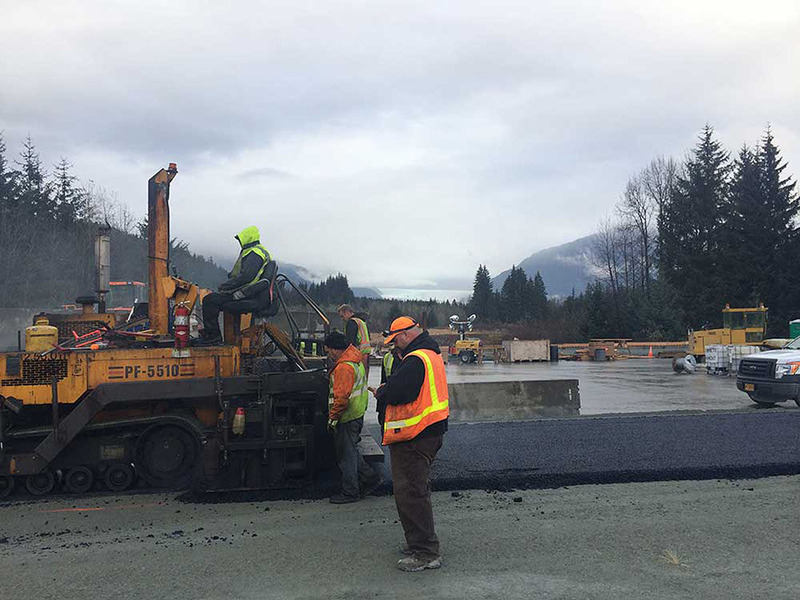 Paving crews paving the approaches to the Phase 1 portion of the Brotherhood Bridge. First Girder off the Barge. 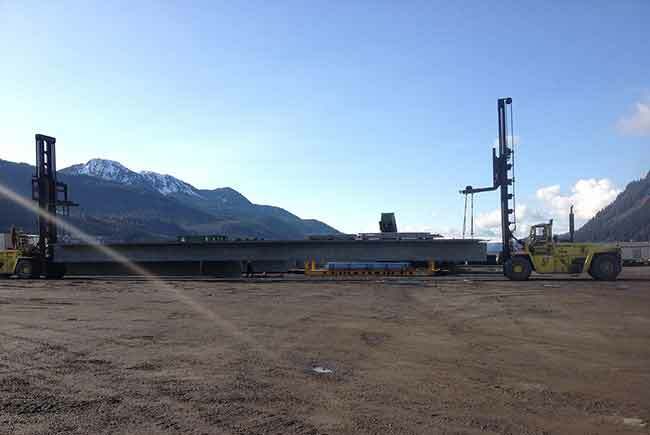 Girder Coming off the Barge at AML. 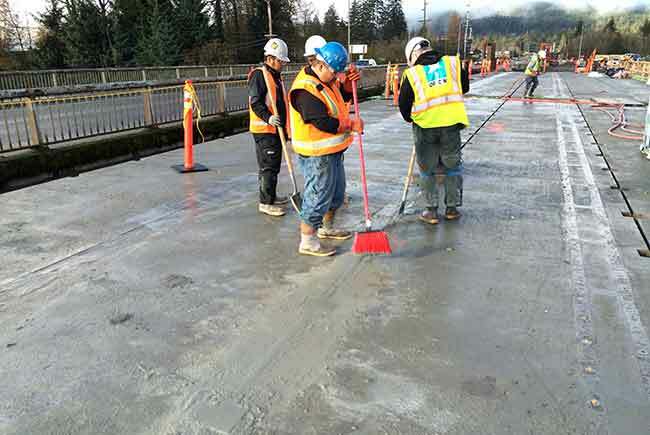 Crews striping the bridge and its approaches. Contractors will continue to work nights striping the rest of the lane markings over the next two weeks, as weather permits.